Congratulations on your up-coming marriage. 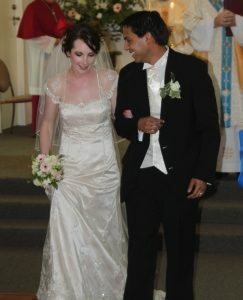 The Church rejoices with you, and wants your wedding day and married life to be richly blessed. The following notes are provided to assist you in your planning. 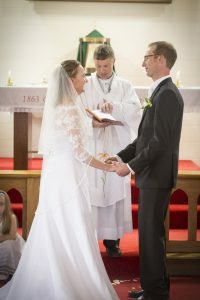 We ask that you make contact with the priest whom you want to have officiate at the wedding as soon as possible and at least six months prior to the wedding. Whether you are active in your faith at the moment or not, the first person you should see is your local parish priest. Be assured that you will receive a warm welcome. Your priest will arrange a preparation course for you which is appropriate to your needs. Usually this involves married people and the priest officiating. As well, there are some forms to be filled out, and the ceremony to be planned. Marriage mirrors the faithful love of God for his people. At your wedding you will make a commitment to love each other for better or worse, in sickness and in health. Thus the decision you make to marry is a very important one, because it is a life-long commitment. The preparation, the forms to complete and the ceremony all assist the couple to prepare for and appreciate what it is they are doing. With God’s grace, their bond of love is blessed and strengthened. The wedding ceremony can be either a nuptial Mass or a wedding service. 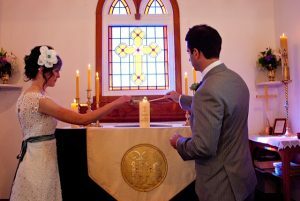 The use of sacred music and scripture readings points to the heart of Christian marriage. fitting place for such a sacred commitment. In exceptional circumstances you may request permission to marry in another setting. Talk to your priest celebrant who will work with you on this. Because the marriage rites have such special significance for us, the Catholic Church asks all Catholics to celebrate their marriage in the Catholic Church. In special circumstances you can seek from the bishop a dispensation from the usual form of marriage. For example if your fiancé’s family are active in another Christian denomination, you may decide you want to be married in your fiancé’s church. Or if your fiancé has a close relative or friend who is a minister in another church, you may wish to have that minister receive your vows rather than your parish priest. The bishop will look positively on requests for dispensation from the Catholic form of marriage in these situations. If you are planning to exchange your vows in another country, please make contact with your local priest. He will assist you with a marriage preparation course and organise the Church’s paperwork to be sent to the place where you are marrying. The local Church in many overseas countries can be very strict about proper procedure, and so early contact with your local priest to attend to these matters is important. If you or your fiancé have previously attempted marriage, and this has ended in a civil divorce, you may be wondering where you stand in the eyes of the Church. In such a painful situation, and after the example of Christ, the Church desires to walk with you and assist you in this sensitive area. The Church has processes which carefully and respectfully assess the validity of any previous union. The healing of past hurts and anxieties becomes a vital first step for moving on. We encourage you to have a talk in confidence with your priest about your situation. The journey to your wedding day becomes an important star ting point for your life together as a married couple. You have much to think about as your big day approaches. Remember that what you are doing is preparing not just for a special day, but for the whole of your life together. The Church rejoices with you both and joyfully accompanies you over the coming months. when people share their lives. This unique relationship is a work in progress, a never ending journey of discovery. The Church wants to assist you in this process. what will be required in terms of marriage preparation. The inventory is an introduction to marriage preparation and is coordinated at a diocesan level. An inventory of statements called ‘Commit’ is facilitated by a trained couple or priest. You will meet with the facilitating couple in their home and use this very useful tool to discover your areas of strength and areas you may need to work on. The primary objective of Commit is to provide a communication assessment for couples preparing to marry. There are 144 statements altogether that each person responds to individually. The Commit inventory covers a broad range of relationship areas. There is a cost of $40 which goes towards materials and training. Commit takes on average two to three evenings. 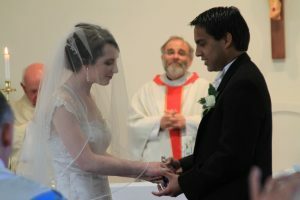 Marriage preparation courses in the Christchurch Diocese are run at a parish level. Parishes use various marriage preparation programmes. The material presented is designed to be skills based and educational. The John Paul II Centre for Life offers preparation for engaged couples through two interactive Joy-Filled Marriage seminars. 2) Life Skills for Couples helps couples review the practical life skills and virtues which contribute to a resilient marriage and to form a plan for cultivating these.